After the official weigh-in and the drawing ceremony, the ASBC Asian Confederation Boxing Championships started with its first competition day in Bangkok, Thailand where eight preliminary bouts have been held at the Lightweight class (60 kg). Indonesiaâ€™s Farrand Papendang involved to the national team only this year after his bronze medal at the Presidentâ€™s Cup in Palembang. His first opponent was Qatarâ€™s Mohamed Sadeq Abdullateef who was a strong opponent and a veteran but his tactical knowledges were not enough to beat his Southeast Asian rival. Papendang knocked down his Western Asian rival in the final round and won the bout cleary in Bangkok. Indiaâ€™s Manish Kaushik had great results as a junior boxer in the year of 2011 but he had some poor years after that. The Indian boxer is only 19 and proved his best in the preparation events before Bangkok. He had to start his contest with Bangladeshâ€™s Mohamed Hossein who claimed gold medal at the 2010 South Asian Games. The Bangladeshi boxer had great footwork but he was not enough brave in the attacks while Kaushik was patient in spite of his age and awaited for the best attacking moments. The Indian youngster knocked down his opponent in the last round and celebrated his victory in Bangkok. Iranâ€™s Golara Forootan was involved to the national team in 2007 and since then he won some international tournaments including the China Open Tournament. The Iranian boxer was a bit slow and awaited for his opponent, Bhutanâ€™s Tshering Wangchuk in the opening round. Forootan did not underestimate his opponent but turned up the heat from the second round while he was enjoyed the final three minutes. The Iranian veteran won their contests and advanced to the last 16 in Bangkok. Jordanâ€™s Obada Al-Kasbeh was bronze medallist at the Incheon 2014 Asian Games and arrived to the venue as secret favourite of the ASBC Asian Confederation Boxing Championships. He was silver medallist also in the last edition in Amman at the age of 19 but he needed to do his very best to eliminate Koreaâ€™s National Sports Festival winner Lim Hyun Sok. The rhythm of the bout was excellent and both boxers were not in the position to save any power in the final gong. Al-Kasbeh was a bit more accurate than his Korean opponent and secured his place in the last 16. Vietnamâ€™s boxing life developed well enough in the recent years and their talented team secured the second place in the team ranking at the Southeast Asian Games in Singapore. Their most experienced boxer, Southeast Asian Games silver medallist Nguyen Van Hai was confident in his opening bout against Chinese Taipeiâ€™s southpaw Lai Chu En while he was supported also from the local Thai boxing fans. Nguyen won the bout with great tactical performance and can prepares to his next contest in the Top 16. Japanâ€™s AIBA Asian Olympic Qualifiers bronze medallist Daisuke Narimatsu won the Presidentâ€™s Cup in Palembang, Indonesia in April where he defeated the elite of the Asian continent. The Japanese boxer arrived to the venue with great expectations and tried to keep control his bout against Turkmenistanâ€™s Hursand Imankuliyev who defeated strong rivals at the AIBA Youth World Boxing Championships. The Japanese boxer was enough confident, he was quicker in the opening round while Imankuliyev was several times in the corners when he was easy target for the speedy Japanese athlete. Turkmenistanâ€™s teenager did not give up the bout and he had some wonderful punches in the second round. Imankuliyev proved good performance but his strength was not enough to turn back the contest. Tajikistanâ€™s two-time Olympian and AIBA World Boxing Championships bronze medallist Anvar Yunusov moved up to the Lightweight class (60 kg) in 2013 and since then he adopted the strength of the punches. Tajikistanâ€™s southpaw had only single punches in the opening minute against Iraqâ€™s Ammar Jabbar Hassan but he turned up the heat after sixty seconds. He was faster and more accurate than his Iraqi opponent but his right arm was injured still in the opening round and could not continue the bout in Bangkok. 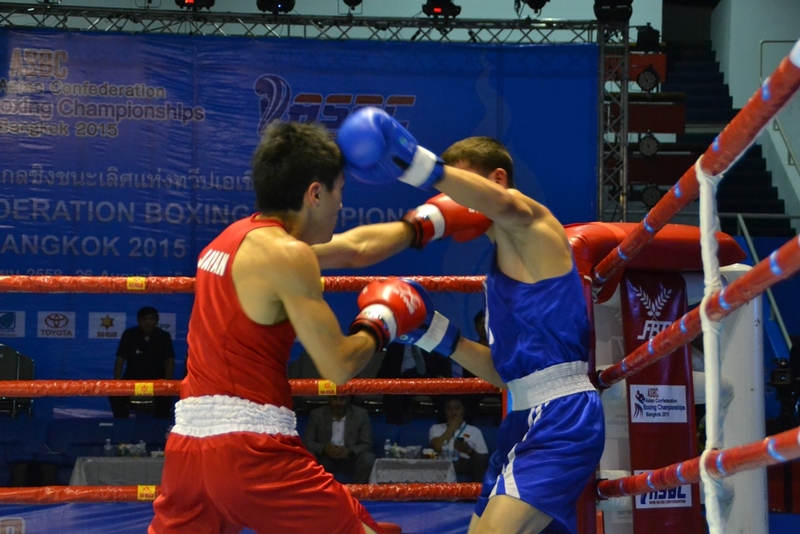 In the final bout of the opening competition day Kazakhstanâ€™s two-time National Champion Zakir Safiullin had to box against Chinaâ€™s Shan Jun. Both athletes competed in the World Series of Boxing where Safiullin became Team Champion in June. Safiullin felt the rhythm in the opening round and his footwork was too quick for the talented Chinese boxer. The Kazakh veteran used a smart style, he was in different level than his Chinese opponent and won their contest by unanimous decision. The continental competition will be continued with its second preliminary day tomorrow when thirteen bouts are in the program. The venue of the event is the Thammasat 6 University in Bangkok.